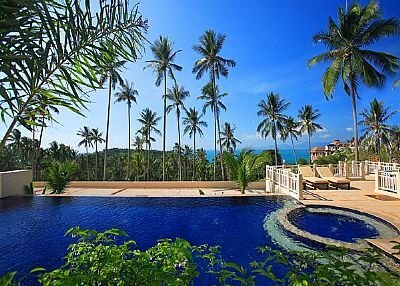 Villa Baan Sans-Souci is situated in the up and coming high-end residential area of the island of Koh Samui. It is a semi detached house in a selected artistically designed development of 5 separate 2 story buildings trimmed with two infinity edged swimming pools with Jacuzzis. Kalara Gardens Resort is surrounded with tropical vegetation and set in landscaped gardens of flowers, fauna and tropical plants overlooking the Gulf of Siam reflecting its blue turquoise waters with magnificent views on to the neighbouring island of Koh Phangan. Kalara Gardens is located only three minutes from the beach, numerous beach front restaurants and the 4 Seasons Resort, five minutes from Samuis only international standard golf course and ten minutes from Samuis capital town Nathon. The 2 bedrooms are located on the upper floor furnished with king size beds and each with en-suite bathrooms. Air-conditioned with external units to avoid high noise levels. The 2 bedrooms have balconies but the master bedroom has a large balcony that overlooks the swimming pools and the seacoast of the Gulf of Thailand. Perfect for those snacks and cocktails in the relaxing ambiance of unlimited scenery. The built in teak closets and vanities give that extra comfort The rattan lamps match the king size bed design. Clear light colors that reflect themselves on the highly white glazed floors. The en-suite bathrooms floor tiles are in a natural stone color to give the feeling of simplicity while trimmed with elegant white and cream tiles. cutlery, kettle, toaster, porcelain & glassware. The living room is furnished in leather with side and coffee tables and lamps to enhance its decor with entertainment of a 42 inch Plasma Flat Screen Television (High Definition), DVD & CD Player. There is a guest WC and a large cupboard for storage between the living area and kitchen. Other facilities include: Security System, Safe, Car Park, Laundry, 24 Hour on site maids / staff, Concierge, Car Rental & Tour Bookings.